Sad Cayenne doesn't think she's in the middle class. As we're in an election year, the two major party candidates are talking about how we need to improve things for the middle class. It makes sense. There's a great deal of mythology about the middle class in America, and it's a deep well for politicians to draw from. It doesn't hurt that we still don't have a consistent definition of what it even means to be middle class, despite the efforts of this little blog. Nonetheless, the middle class exists, even if we can't agree on how to define it, and, somehow, everyone thinks they're middle class. While I like the idea of defining the middle class in terms of household income quintiles, most of us can agree that the middle class is a relative term, not an absolute one. To be in the middle, you need something on either side. A conflating factor with defining the middle class is location. Certain cities are a lot more expensive than others. Six figures don't go as far in northeastern cities of Boston, D.C., and New York as they do in the Rust Belt. And because rent is higher in those locales (not just for your apartment, but for every brick and mortar merchant in your area, too) the cost of everything gets inflated in high cost of living areas. The groceries cost more. The gasoline costs more. It all filters down to your personal budget. So it's not surprising when someone in Los Angeles might not consider himself middle class despite earning sixty thousand a year, while someone in Cincinnati might consider herself middle class while earning forty thousand. As with everything, we're talking in relative terms. So it's hard to know exactly what constitutes a middle class income in your locale. 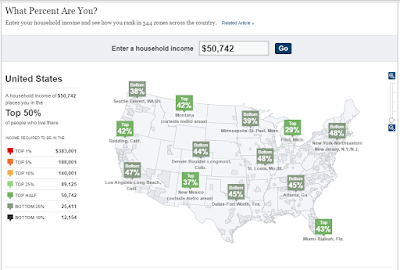 I love the tool, since it illustrates how different average incomes are across the nation. A family earning $50,742 was right at the 50th percentile nationwide in 2012. But that same family would be in the bottom 38% of all families in Seattle, and the top 29% of income earners in Flint, Michigan. In case you were wondering where the Done by Forty household falls, we're solidly in the top quintile nationwide, as well as within the Phoenix metro area (which seems to be about as close to the national average as you could hope for). As a liberal, this is a tough pill to swallow, since (like everyone, apparently) we want to considers ourselves working class or, at least, middle class. But the numbers don't lie. We're earning more than most people in our city, and in the nation, which probably explains why we can approach financial independence at the rate we are. We'd like to think it's all about frugality and savvy investments, but the fact of the matter is that above average incomes seem to be a pretty common theme in the FIRE community. Just calling it like I see it. Though the way your local government collects taxes can have a material impact for early retirees, the federal government makes no such distinction based on location. A family earning $100k is subject to the same taxes in New York as they would be in Indiana. While this is inherently unfair, it's also the system we all work under, so why fight it? Workers should consider geographic arbitrage as an option: trying to keep your high paying job, while moving to a lower cost area and telecommuting. Or, absent that, leveraging your big city pay when moving to a cheaper city, insisting that you need to keep the same level of compensation. If such a move isn't possible or desirable, at least try to calculate your net pay when considering job offers from other locales. $80k in Ohio may net you more money for investments and leisure than $100k in California, when the relative costs of living and taxes are considered. If you want to stay in, or move to, a higher cost of living area, apply the same analysis, aiming to understand the total cost of a locale. Any real discussion of what we mean by "the middle class" has to consider the impact of location. Using a single salary range to define the middle class for the entire nation ignores the wide variance in costs and taxes that similar-earning families pay in our nation. But that's enough blathering for an early Monday. What do you think, readers? Do you consider yourself middle class? Do you feel like an average family in your own city or neighborhood? I distinctly remember my father complaining about this very issue when looking at proposed tax bracket changes during the last election cycle. He earns over $100k/year yet does not see himself as a high earner because he lives in a high cost of living area. The national guidelines around who falls into what 'class' certainly don't always translate to the local - and then there is the difference between income and net worth when you are defining wealth! My husband and I transitioned from (apparently) middle class to upper middle class in our income when we exited graduate school, but since that also corresponded with a move from a median to a high cost of living city we don't feel much different! It could also be because incomes and housing prices are rising so quickly in our new city (Seattle, because of Amazon) - the 2012 data is probably quite outdated in this locale. I hear you on the 2012 data. I tried to find something more recent but couldn't, and the tool was just too cool to leave out of the post. Seattle is a wonderful city that we try to visit once a year or two, but it's gotten so dang expensive in the past decade or so. I wish our federal income tax laws were flexible enough to account for high and low COL areas. Or, absent that, that we at least considered location when loosely defining "the middle class", you know? I agree it is a good widget and I was happy to see Seattle featured on it, but yeah it does need a refresh! In my own little project I do try to take local COL into account. Kyle and I started a website http://www.phdstipends.com/ a couple years ago that collects self-reported stipend info from grad students. We then normalize the gross stipend reported by the local living wage and report the ratio. It's pretty eye-opening! We are doing well! New city, job, business, baby... Every day is passing quickly! Congrats on all the new-and-good-changes! I need to get back into reading your blog. I checked out that PhD stipends site, too, to see where Mrs. Done by Forty's income lines up. Seems like we're on the lower end of that economy! :) Very cool project though. Welcome to Seattle Emily! A great city but you are absolutely correct that the cost of living has gone insane in just a few such years. Not just because of Amazon, but that certainly is a contributor. If you haven't already, get your real estate purchase in (near good schools of course), because the forecasting growth/demographic models show no let up for decades to come. Another 800,000 people by 2030, I just heard. With costs what they are for real estate, do you think personal finance folks (i.e. - those who would invest the difference, rather than spending it) would be better off renting in Seattle? I don't believe so. The market is just too tight. If one rents (right now anyway) one is likely to fall behind the buyers, particularly in the SFH (single family home) part of the market. Rents have been rising steadily and Zillow predicts Seattle will be #1 in rent growth next year as well. If one can afford to buy, and plan to live there for any length of time, one should buy not rent. I'm biased of course, I rent out two places and live in a third, all in King County. The rents basically pay their own mortgages and the appreciation has been virtually immediate (one I bought only 4 months ago). That being said, location still very much matters (good schools, access to main roads, or main employers, etc.). There are always "bubble" risks, but the fundamentals of that particular market are just too sound (huge job growth (not just Amazon, all tech, including Bay Area tech setting up satellite offices for access to PNW tech talent that doesn't want anything to do with living in California), international investment, limited land, good schools and good environment, etc.). Like Emily noted, if she's not going to be there for a long time, the transaction costs of buying/selling might wipe out any gains, and the risks of owning an asset for a short time are more pronounced. Still, rapid housing appreciation can certainly make a home purchase look like a fantastic idea: who doesn't like making five or six figures in a short amount of time? Nice posts Emily. Like your husband, my wife is also in the life sciences field (pharma) and that is indeed a tough field to do much with (long term) in Seattle. Most things either fade away or, when they get remotely successful, get bought up and shipped out. That's why we pretty much live bicoastal now, because my consulting gig gives me great flexibility. DBF, I totally get where you're coming from, and am normally right there with you. Still, when you see a 10-bagger (to use Peter Lynch terminology), particularly when the stock market is anemic and likely in a bubble of its own, you jump on such opportunities. Makes sense. You can't hit a homerun if you don't swing away. Hmmm... well I'm sure I'm the outlier here, because I've always earned pretty near the bottom. The great irony of it being that the only time I ever made it into the top 50% were the first 2 years after I quit my job, when I still had my work-a-holic attitude, and my business was going great guns. Things are definitely much more expensive in Denver than they used to be - I think a studio apartment now costs around $1350/month! Eee gads! I still believe, though, that you don't have to make anywhere near the amount of money that people think in order to live comfortably and become fiscally independent. Of course, it requires a great deal of "out of the box" thinking, as well as a willingness to make radical lifestyle changes - which, I think, most people are not willing to do. You know, when I first embraced this movement 20-some-odd years ago, it had a completely different name and focus. It was called the voluntary simplicity movement, and it was less about finding ways to "retire" early, than it was about trying to live a less consumer driven lifestyle. So I guess I never considered radical lifestyle change any sort of an obstacle, because it was part and parcel of what I was trying to accomplish. My buddy was telling me about what rent is going for in Boulder the other day. People are advertising single rooms in a house (a shared living situation) for a grand a month. I couldn't believe it. As you said, it's not impossible to get ahead, even without a top income: it just takes ingenuity and, I assume, a lot of hard work, too. But it's do-able. I wonder if it's even harder now than it would have been 20 years ago, given the state of wages relative to inflation over that period. And great point about the different names we have for FIRE. Simplicity is a much nicer term, and probably more true to the ultimate goals of freedom, spending/consuming less, etc. Back when I first heard about this stuff, the term I heard bandied about was "independently wealthy" which is kind of awful sounding, now that I think about it. I like that you aren't aspiring to be middle class, either. I am, for better or worse. I feel like I am solidly in the middle class but when I look at the figures I am technically in the top 20%. I definitely live in a rich area but I also display stealth wealth. I don't drive the nicest car or live in the best house. But these are not things that I truly value. I have a lot of friends that have nice cars and homes and I use to think that they had lots of money to pay for these things. It wasn't until later on I found out that they couldn't afford these huge car and house payments and how much they truly struggled. Sounds like we have the same situation: feeling like we're middle class even though the numbers don't totally line up with that. I suspect that's part of the reason we all think we're middle class: we tend to live in neighborhoods that are somewhat homogeneous in economic terms, and we all feel pretty average. And like you said, it's tricky to know exactly how well people are doing just based on outward representation like cars & houses. That's one reason income is a nice metric: it's a lot easier to compare (even if it doesn't tell nearly the whole story). I was surprised how expensive Mpls was compared to LA and NY. When I plugged in our income for Mpls we didn't fare as well as I'd thought (I was using net income) but when I plugged in in for rural MN we were doing excellent. Very interesting!! I've seen that site before and it certainly gives a global perspective. Even the poor in the US seem wealthy compared to the poor elsewhere. I'd say we were upper middle class except the widget isn't working for me so I'm not sure! Plus I support two households and that's something that the widget can't take into account. You (hopefully) can click on a state or city and compare your household income to that regions'. But yeah, a single income in two different households...that's tricky to work into the averages. My partner and I are above, though close to, the upper class line. I would consider us lower-upper class but at the same time we have no children... which I think probably nudges us closer to middle-upper class. Yeah, family size can have an impact, too. Though the data gets messy quick with that (e.g. - a 3 person household can be a two-income household with one kid, or a single mom with two kids). I hear you on the last point, too. It's great to realize how fortunate we are if we're lucky enough to have an above average income. I love this post! When people talk about their income, they often forget about the cost of living in that city. That's like only looking at a business's profits and ignoring all expenses. Not an accurate picture. A person earning $40k/year but lives in Thailand/Mexico/small town USA is actually MUCH MUCH better off than someone earning $80k/year, living in New York. This puts things into perspective. That's why when people say "$40k/year retirement income isn't much", my response is "depends on where you live". Oh and btw, here are some food recommendations for when you go to Japan. Make sure you eat EVERYTHING! Of all the places we've been to, the food in Japan can't be beat. And the prices are actually really reasonable for such high quality food! This franchise makes, hands-down, THE BEST RAMEN in the world. Seriously. They only make 1 thing and they make it INSANELY well. Best of all, you get to customize the oil, garlic, and richness. And only costs $7USD/bowl. 2) Uobei sushi. This is an awesome conveyor belt sushi restaurant where each plate starts at only $1 USD. Very popular with locals. Be prepared for a long wait on weekends though. 3) Get a Chirashi bowl (rice + fresh sashimi, salmon roe, sea urchin, etc) from either “Ameyayokocho Market” or “Tsukiji Fish Market”. The first one is more local and better value and 2nd is more touristy. Both are good places. 4) The kobe beef place we went to in Osaka is called “Tsurugyu”. Most expensive meal of our trip but totally worth it! 5) Try the Soba noodles at the train stations restaurants. They are AMAZING..and only $5-6USD/bowl. As you said, location determines so much about what kind of spending numbers you'd want (or need) to live a happy life. The numbers are fairly arbitrary...it's about having a nice house that's kept at a comfortable temperature, healthy food, reliable transportation, etc. The cost of those things varies wildly, but the goal is always the same. I think every post will need a picture of Cayenne. I had the same feeling when I entered the numbers...I feel like I'm in the middle class. And to nitpick, I guess it doesn't ask for household size. Having a couple of little ones really will help squeeze your budget. I've had many co-workers complain about the fact that the federal government does not make a distinction based on location. I think it would make the system even more convoluted, but I can see some inequity. Tax deductions and credits start phasing out at the same income levels country wide but someone making $50k in the rust belt has a lot more discretionary income than someone in NYC. And while not governmental, the same issue comes up in college financial aid. A NYC family making $100,000 might not qualify for aid because they are "high income" yet not have as much discretionary income compared to a family in the rust belt. Ok...end of high cost of living rant! It's not fair. I'm very surprised Democratic candidates aren't talking about this, since most of our high cost of living areas tend to trend blue. Great point about financial aid! I totally skipped over that but, yes, financial aid is a place where people whose parents live in expensive cities are getting the short end of the stick when it comes to financial aid, which seems particularly unfair...since it's being passed down a generation onto some teenager. Before we go all boohoo for the poor coastal folks with HCOLs, let's not forget that one of the biggest government subsidies of all, the home mortgage interest deduction, is overwhelmingly used by (in terms of the U.S. as a whole) wealthy households, particularly those with jumbo mortgages. Buying an average house in most parts of the U.S., it'll be tough to accumulate enough in interest to take advantage of that deduction.... But if you buy a big or expensive house with a large mortgage, it's a heck of a lot easier. Steps down off virtual soapbox. Sorry, that is my pet peeve tax issue. I hear what you're saying, but I have never thought it was that much of a benefit for those people, even the wealthy. As you noted, the first $12,600 of deductions are worthless: that's just the standard deduction. So we're just talking about deductions above that figure. For a high earner in the 33% tax bracket, for every dollar of tax benefit they get from the home mortgage interest deduction, they're paying three dollars in interest on a huge home loan. It's still a crap deal for them, IMO. I'd be very interested to compare the average tax rates of different cities though. No need to go all boohoo for coastal folks...we choose to live here. But I'd take being able to buy a nice $250k house versus getting a mortgage interest deduction. There a lot of things about that tax code which can be frustrating. I don't live in Manhattan or hip part of NYC, but it's a good neighborhood with good schools. I rarely see houses under $700k. I could move further out into the suburbs to find houses under $500k but then there are property taxes north of $10k. Upper 50% in Tucson, lower 30% in Orange Co. California, where I grew up. It's the reason I left. Too expensive for my career choice. The key to my early retirement plan is to live in a cheaper area and it's working well so far. Cayenne looks upper-class to me. 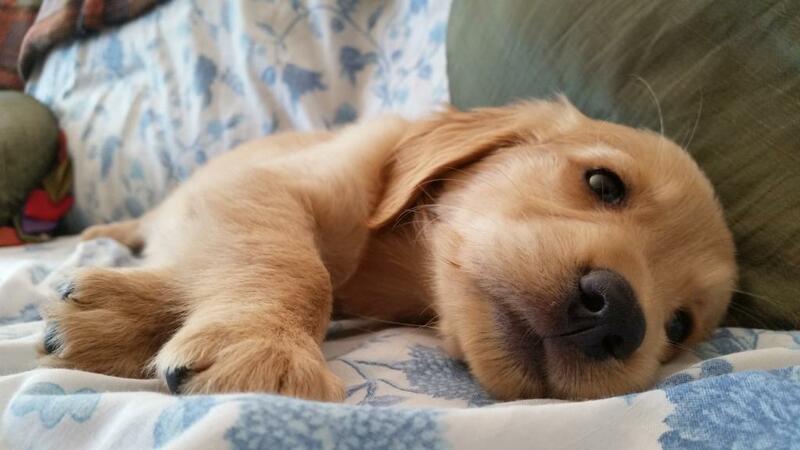 Still in bed with no reason to get up until breakfast is served. My dogs are definitely upper-class. Yeah, our puppy's pretty high class. And we spend a lot of our hours waiting on her hand and foot...so I guess in some ways, we're her servants. It's like Downton Abbey up in this piece. AZ has been a godsend for us, as we also moved her from southern CA. Everything's so cheap, and we're somehow earning a lot more in AZ than I was in San Diego (probably a function of me just getting more experience in my field than anything else). Still, we love it here: a fantastic place for early retirement. We're in the top 40% of our rust belt home, but still qualify for select programs like free file at the federal level. Here's something else: the wealth gap is increasing. Those with a lot of money may be fewer, but they're pulling in a lot. When we compare percentages, that certainly doesn't mean that the people in percentiles directly above or below us aren't struggling at some level. A major reason I think the middle class struggles much with debt. They perceive themselves as better off than 60% of their local peers, so they lust for a lifestyle that represents that tangibly, regardless how much other people in their area are aren't struggling. I agree that local taxes can impact things---if you're location independent and making big bucks, you can move to one of the states that doesn't tax income. I hear you, which is why I think the income quintiles for your specific city are way more helpful in determining if you're middle class, than those at a national level. I like the take on debt in the middle class, too. I suspect that when people feel they're "middle class" based on some unscientific definition, then their purchases are likely to follow suit. (e.g. - I'm middle class and I can prove it, because I have two nice cars and take a vacation every year with the kids.) My (naive) hope is that defining middle class by strict income levels, or wealth levels, that might replace the need to prove you're middle class via showy purchases of cars, home upgrades, vacations, etc. Good point about the wealth gap increasing. It's not a huge issue for me personally (I really want to be one of the people acquiring wealth, so I can't be too hypocritical about it). But still, there's a problem when nearly half of Americans have no retirement savings whatsoever, and maybe very few assets altogether outside of their home equity. I guess another point is just because you're in the middle of income earners in your area, does that truly mean you're middle class? Not referencing the chart on this one, but Detroit in recent years comes to mind. In our case, we are solidly middle class, but for others the same may not true. Good point about there being no ceiling on income, but a hard floor. And good call about the local comparison not necessarily being the end-all, be-all, either. I suppose looking at both the local and the national comparisons provides the needed context, with a slant towards the local being a 'truer' marker of where your household fits. I can't say for sure whether being in the middle quintile in a place like Detroit is perhaps not putting you in a 'true' middle class. But FWIW, you have to earn more to be in the 50th percentile in Detroit ($50k) than you do in, say, Pittsburgh ($47.8k), at least according to the NYT tool from 2012. Which all goes to say that perceptions of what it means to be middle class are tricky and subjective. The metrics in the blog post are just one approach (and one from the hip, at that) to try to make the comparisons more objective and measurable. But I'm positive there is a better way to approach that kind of objective definition than the one I took. Meh bad example. Haha. I always forget how low-cost stuff is here in Pittsburgh. At that median, though, families still qualify for WIC and I'd argue have a hard time functioning without state assistance depending on the size of the family---or waffling back into it. Even here. I guess measuring where the middle class is is different than assessing where the middle class currently is, if that makes any sense. Truly not trying to be adversarial here. You're just one of my favorite people to bounce these things off of. I always know you're not trying to be adversarial. I honestly love debating these concepts but, as I suspect most writers are, it's tricky when it's your own writing that's the fodder for discussion...and it gets hard not to be defensive sometimes. Still, we trudge on. And no offense taken! Love it when you post a comment here. My very first job in San Diego was working at the WIC office, and it's a fantastic program. Still, as you noted, a lot of people qualify for benefits and I don't doubt many of them see themselves/are seen as middle class. However, we should call out that, at least way back in 2001 when I worked there, the benefits weren't tied to local cost of living figures, but national cut offs. And as you've pointed out before, the size of the family (and the makeup of the family) puts a lot of needed context into those figures. A single mother with two kids will have different needs for assistance than three adults who live in the same household, etc. etc. Trying to determine who's 'really' middle class is tricky. I'm fairly enamored with the concept though, and think I'll keep writing about it (one more post coming Monday). I think Mr PoP and I tend to live a pretty middle class lifestyle, but it was a while ago now that I remember commenting to him that I had come to the realization that we were probably "rich" and that it felt kindof strange to come to that conclusion. That said, it's also interesting how concentrated wealth can get geographically. We live right smack in between two metro areas, and Mr PoP and I do most of our work (and outside of work socializing) concentrated in those different areas. In the one Mr PoP goes to, our household income puts us in the top 5%. In the one I go to, we're in the top 10%. (Probably even lower if you just looked at the zipcode where I work, actually, since it's quite a wealthy area.) Not middle class in either case, but still a pretty big difference. We're different people, with different jobs and expectations, but I think the relative wealth of the two areas also plays into how much social pressure we feel to conform to the average consumerist lifestyle, but counter-intuitively. I think I get less social pressure in terms of consumerism since as a young working person it's not really expected that I have and display the same level of wealth as wealthy retirees who have had a lifetime to accumulate their millions. Whereas Mr PoP is in an area where people are mostly still working professionals, and are comfortably spending money as they go along through life, but there's kindof an unspoken expectation that he do the same. That's a really neat example of how nuanced the pressures can be between different locales (or in your case, different companies and, like you noted, two different people). We, too, are kind of struggling to come to terms with the fact that we're "rich". It's a weird feeling...some guilt is mixed in. We should probably give away more. My hope is that by focusing on objective measures (income, wealth) rather than subjective ones ("I feel like I'm middle class") that our behavior will improve. That we'll feel more gratitude, and give more. Thank you for pointing out this tool! It's fascinating. It really, really drove home just how ludicrously unaffordable everything is here in San Jose. I plugged in $100,000 for kicks (I don't make that) and that is only the 44th percentile for this area. It's just insane to think how much more some people are making. No wonder this is one of if not the most expensive real estate market in the country. The Bay Area really is crazy expensive these days. When I was moving out to CA, it came down to San Jose & San Diego. I had no job prospects in either place and, being a dumb 19 year old, just picked one at random. I consider income like exercise, you can earn or workout all your want but really matter is how much you spend or eat. I use to exercise all the time but until I changed my eating it didn't do much good. Now I just need to figure out the spending part! I hear what you're saying and spending is definitely the easier part to get under control. But I think income is more important. While you're right in that no amount of income is going to help you if you spend every dime you make, you can only cut down on your spending so much. Frugality gets good press in the personal finance community because so many of us earn an above average income already. Trying to tell someone earning $25k to "save their way" to financial freedom isn't great advice. And, on the other hand, someone who's already earning six figures doesn't need to worry about income at all: they can just focus on spending and they'll be wealthy in short order. I would say that we are definitely in the upper 20%. The problem is that we have a lot of student loan debt, particularly my wife, because her pursue of a doctorate. That will eventually go away, but in the interim I hate sending thousands of dollars to the government each year. But in terms of income and savings we are definitely up there compared to others. The sad thing is we have more savings than my wife's parents do. That is what motivates me even further. Yeah, income is certainly only a piece of the total picture. I wrote a piece on middle class wealth a while back, to focus on asset quintiles. As with everything, there's no one metric or area that gives a full picture, but the more of the things we can add to the analysis, the better understanding we get. I'm personally a big fan of student debt if you can finish, get your degree, and are pursuing a field that improves your income over what you currently make. Given those pretty reasonable parameters, I think that student debt is a preposterously good value, and has a fairly quick payback period. Still doesn't make cutting those interest payments any easier, I bet.